To show my appreciation for Gayle for being so nice to me and also to celebrate my recent job promotion, we went for a splendid crustacean international buffet at Ritz Carlton Millenia's Greenhouse restaurant this week. (Above) At our usual spot, the same table when we were here previously but now with more cushy chairs. (Above) A closer peek at what we ate. As we are both avid seafood fans, we had a 3hr makan session, gorging on boston lobsters, fresh oysters, crabs, succulent mussels and scallops. There was of course also sashimi, a mainstay of many buffets. The seafood was very fresh, especially the lobsters which were poached freshly on the spot. The baby lobsters were more tender than the boston lobsters so it depends on whether you want more meat or less meat but more tender. (Above) Boston Lobster - very fleshy and fresh! I had my raw oysters with a tinge of lemon juice. Fresh and without any fishy taste. What we like is that the seafood is really fresh, doesn't taste fishy and the meat is tender. The scallops and mussels also had roe which is just sinfully delicious. The service was very good. The service staff exercise initiative and served us complimentary english breakfast tea. The dessert section was really another rich experience. Those who are into strawberries and chocolate desserts would have thought they had gone to heaven at Ritz. The pastry designs inspired my dearest Gayle and she complimented the pastry chefs there whom she chatted with when they were replenishing the dessert trays. (Above) Gayle smiling before her crustacean treasures. There was also a quartet playing live jazzy and soulful music which really made the night an enjoyable one, with occasional playing of different versions of the birthday tunes for those who were celebrating their birthdays there. You can get the violinist or guitarist from the quartet to go right up to your table to play for you if you desire. All in all, we really had a rich dinner. All in all, it cost us slightly over $150 for 2 persons after a 15% discount from UOB credit cards. Considering the amount of good seafood we had plus the good ambience and service,it was value for money. Surprise surprise, Gayle bought me a Gucci wallet to replace my old wallet from Braun Buffel that was bursting at the seams. We had been looking at wallets while we were in Japan but found those that we liked overpriced there. We finally found a wallet that had one of my preferred colours for wallet - grey and with enough pockets for all the cards and a photo slot. (Above) Good array of pockets to carry all my cards plus a slot to slip in our photo which I always carry around with me. I must buy her a good dinner at least to thank her! Very touched cos it's from her hard earned savings. That is why I always tell myself I have the best wife in the world. 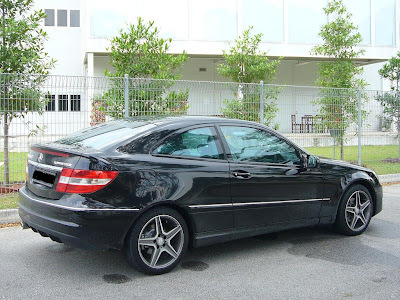 We took delivery of our new car - a metallic Orbite Black Mercedes CLC 180K coupe this week and have been very happy with the feel of the car and the drive which is very smooth and the direct steering system, sourced from the SLK steering rack, is very responsive and reassuring. The car corners well with firm but comfortable suspension. The car's wide array of safety systems like SRS,BAS,ABS,ESP makes us feel very protected on the move and the car is well insulated from road noise. We upgraded the wheels and rims to 17inch from the OEM 16 inch at Poh Heng Tyres at AMK. 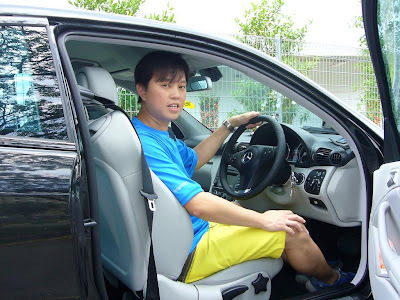 Poh Heng is well known for good pricing for it's range of rims and tyres and Justin from Poh Heng provides good service. He stayed open into the late night to check that the tyres were fitted properly. We did a road test for this and he asked me to contact him if I had any issues after that. We also did a avant garde blue tint solar film at Cool n Lite at Paya Ubi where you can get between 10 to 20% discount for packages. I changed the mufflers at Autobacs and the service was quite good as the mechanic there went with me to look at the mufflers, try out the different mufflers and polished the mufflers for me. For the car's paint protection, I went to Toughseal in AMK Autopoint. We also went to purchase a customised 3M car mat at a wholesaler at Ubi Industrial estate. Gayle and myself got a good deal for the trade in of our mitsubishi 'i' and for the purchase price of the CLC, getting a good discount for a new car. 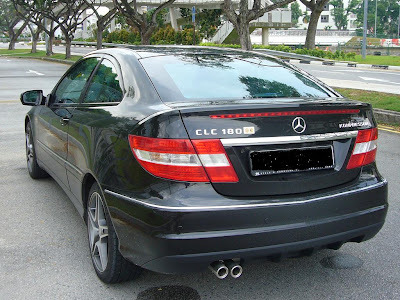 Those who are looking for a merc at C & C, you can contact our Sales Rep - Luno Lim at 91290205 or luno.lim@cyclecarriage.com.sg. We are recommending him because he gave good professional service, drew up a customised price package, liase with our bank to remove a loan redemption penalty, and did his best to cater to our requirements and give the best possible deal he could and has offered personal after sales service such as collecting our car for delivery for servicing etc. (Below) Interior console of the CLC. The radio display is very retro. We like the maple wood inserts. 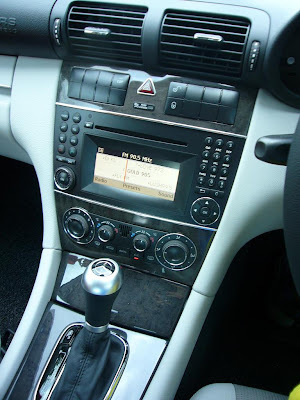 The car's built in Bluetooth handsfree phone is quite useful for answering calls in the car. Our CLC coupe from the rear. Driving the car takes some getting use to since the rear windscreen is high booted and field of vision is narrow so reversing the car and overtaking requires a more careful look at your blind corner. All in all, we are looking forward to more road trips in our new car.